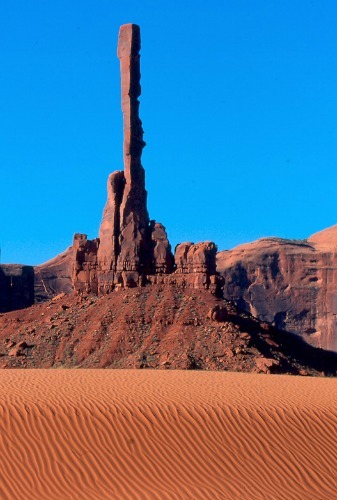 Monument Valley is a column of blue-clad mounted Calvary, led by John Wayne, charging across the seemingly endless desert, their horses’ thundering hooves kicking up choking clouds of dust, a strident bugle spurring them on. This is a land of striking beauty, a land of towering buttes and spires, Yei Bi Chei and totem poles, crenulated sand dunes and the ubiquitous tumbling tumbleweeds. 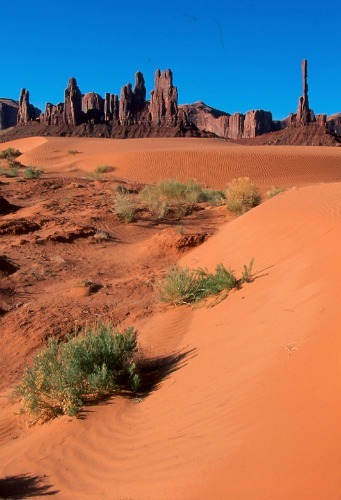 John Ford found this spacious land lends itself to the fantasy of the imagination, and millions of people, visitors from all over the world, would agree with that assessment. 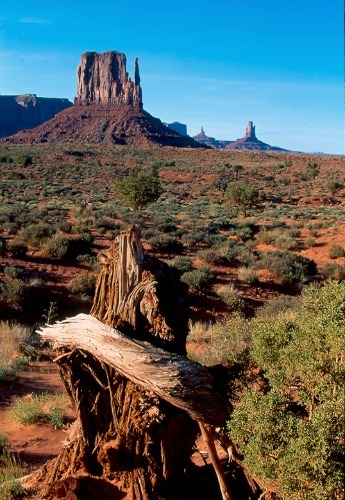 It has been over 20 years since I first visited the park or, as it is known today, Monument Valley Navajo Tribal Park. At that time, the road leading into the Park from off Highway 163 was just a dirt road, and visitors were immediately greeted by a shanty-town of Native-American vendors selling everything from hand-crafted jewelry and Navajo blankets to Kachinas and Navajo pottery. These shops were nothing more than simple rag-tag wooden structures put together out of scraps of lumber, canvas tarps and corrugated tin salvaged from who knows where. It was like something out of a third-world country somehow misplaced in this land of striking beauty. I found it denigrating and a poor first impression of the Navajo, a proud people, rich in cultural history. Today, thankfully, this rag-tag shanty town is gone; replaced now by a beautiful modern complex which houses a Welcome Center, Amphitheater, Arts and Crafts Mall, a new hotel with restaurant and trading post. The Arts and Crafts Mall, also called Indian Market Plaza, is made up of shops of some of the local artists. There is also a food court within the Plaza. Twenty years ago, there were always several independent Navajo guides with pickups or jeeps waiting to take visitors on a private guided tour. scenic loop in open-air vehicles driven by knowledgeable Navajo guides. One thing that has not changed, however, is the primitive dirt road, often clogged with tourist-packed tour-vehicles leaving clouds of thick dust in their wake. If anything, it seems somehow rougher, dustier and less accommodating of anything short of an army hummer. The scenic tour through the Park is seventeen miles. •	The guides are intimately familiar with the Monument and knowledgeable about the history and religious significance of all that you will see here. •	They can take you to places within the Monument where you cannot go without a guide. •	They can help you find unique photo opportunities .e.g. the sand dunes near the Totem Pole. •	You will save wear and tear on your own vehicle. 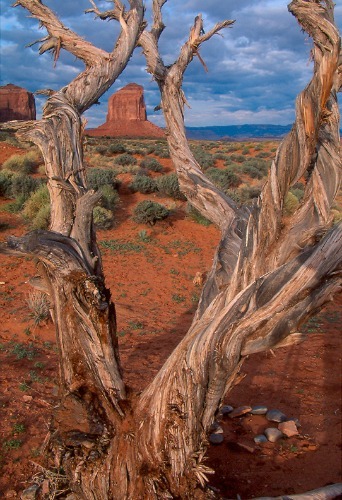 Books and Maps about Monument Valley may be purchased at the Visitor Center, or you may purchase them through Amazon.com by clicking the link below. Additional lodging may be found in nearby Mexican Hat, Utah. The following were downloaded from the Navajo Nation Parks website. I have no personal experience with any of them, nor do I recommend them over any guides who may not be listed.